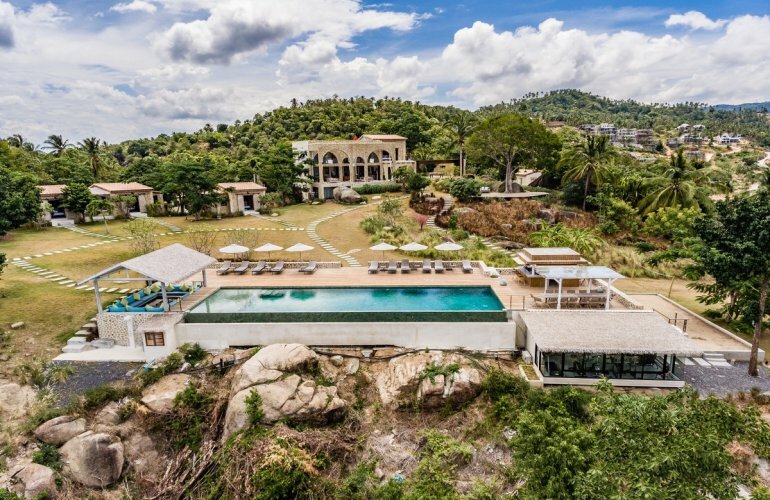 This spectacular 7-bedroom family home with two additional children's bedrooms for a total of eight is spread over seven rai (12,000 m2) of hillside overlooking Chaweng Bay, and could easily be mistaken for a Mediterranean countryside retreat. Here, ‘East meets West’ with an eclectic mix of Asian and European styles, which blend perfectly to create a harmonious holiday villa, ideal for social gatherings and relaxation. The terrain has been carefully considered in the planning and layout of the villa, with the rock-clad main building and bedroom pavilions blending into the natural surroundings. Giant boulders have been retained as garden features with rockeries and lawns around them. The main building is linked to four bedroom pavilions by way of stone pathways amid rolling lawns. With rock and crete-stone walls, terracotta roof tiles, wrought iron fittings and aged wood shutters, the buildings have a distinctly farmhouse French feel – yet the addition of swaying coconut palms rather than olive trees, reminds you that you are, in fact, on a tropical island. The villa is equipped with fiber optic and therefore, high speed WiFi throughout. It’s main building houses the communal living space, as well as the master bedroom, and a library with business centre. Downstairs, you’ll find an open-plan living and dining area, with oversized couches covered in cottons and linens in muted shades, quirky lighting, art pieces and collectables. A solid, aged-wood dining table comfortably seats 18 guests, and is serviced by a built-in bar. This enormous open-plan space is ideal for entertaining, and one can easily imagine wine flowing, music playing, and plenty of laughter, accompanied by excellent food prepared by the in-house chef in the adjoining country kitchen. A pool table, foosball and a dartboard add to the entertainment. The kitchen comes complete with Smeg appliances and plenty of space for the chef to prepare his delicious fare. The villa’s chef has many years of experience in upmarket establishments both in Thailand and abroad, so there’s little need to leave the villa. Whether it’s breakfast in the courtyard, lunch at the pool dining sala, dinner indoors, or afternoon crepes and waffles on the pool deck, you’ll be well taken care of. For the health conscious, a juicer means you can take advantage of the island’s fresh produce and enjoy a healthy juice diet. Leading off to the front of the living and dining room is a travertine-clad terrace, complete with seating and soft-flowing white curtains gently waving in the breeze. Another courtyard leads off from the kitchen, and makes the ideal spot for alfresco breakfasts, served from the buffet counter in the kitchen. Here you’ll find a built-in barbecue too – yet another way to take advantage of the chef’s talents. From the living room, wooden stairs lead up to the mezzanine floor (with floorboards made from reclaimed teak wood) where you’ll find the library and the business centre – if you simply must catch up on some work while away. Features include a PC desktop and a all in one scanner/copy/printer machine, Kelim carpet, bespoke couches, and walls of books to while-away your time. Guests can enjoy their music independently or together in the living room, terrace and courtyard of the main house and the same thing can be done at the pool area bar, pool deck and Sala. The master suite leads off from the library, and offers ocean views from the bed as well as the private terrace, complete with outdoor shower. The en-suite bathroom boasts his-and-hers marble vanities, as well as a double rain shower. Below the main living pavilion lies a multi-purpose room, which can be used as a TV-lounge which includes PlayStation 4 and a DVD player as well as movies accessible via the entertainment network or hard disk, a massage room, or even an additional sleeping area, should the eight bedrooms not be enough for your party. The villas remaining six bedrooms are housed in four pavilions throughout the property. The Mountain View Villa with two bedrooms – one with a king size bed, and the other with twin beds (not inter-connecting). Each has its own en-suite bathroom, complete with double vanities and rain showers, as well as a terrace with seating. ‘Kika Room’ with a king-size bed and en-suite bathroom is in a pavilion of its own, and the ‘Sea View Villa’, has two bedrooms, one with king bed, and the other with twin beds, ideal for younger children that need to be close to parents. A covered terrace with built-in seating offers some privacy away from the main house. To the right of the swimming pool lies ‘Alex Villa’, with two bedrooms – upstairs a king size bed, and downstairs, a large room with four single beds, making this an ideal room for older children sharing. All bedrooms have en-suite bathrooms, and are furnished with crisp, white linen, curtains as well as wooden shutters, air-conditioning and interesting bedside lighting. Polished concrete floors are cool underfoot, and Crete-stone walls add to the rustic Mediterranean feel. The calming, simply furnished bedrooms with their private terraces and seating areas, offer places of solitude to unwind away from the communal areas. Situated below the main house, taking centre stage in the garden, and boasting exceptional sea views, the expansive infinity pool is sunken into a wooden deck, and is flanked with plenty of sun-loungers and deck chairs. To one side lies a pool bar, along with a separate dining sala, and to other side, a covered pool lounge offers shaded seating to enjoy calm resting or movie watching with video projector and 3m widescreen. The pool terrace, with its many seating areas, makes an ideal place to gather in the day as a group. Bluetooth speakers located around the pool (as well as in the main building, terrace and courtyard) allow guests to play their own choice of music easily via their phones. The villas vast expanse of lawns are great for children to run, play and be children, and in the garden below the pool, guests can enjoy a friendly game of table tennis or petanque boules court, or practice their golfing techniques on the putting green. Higher up in the garden, just below the main building, sits a large function deck, built around a majestic tree. This is the perfect spot to do ‘sun salutations’ while practicing yoga at sunrise, or to host an intimate wedding ceremony. While the villas appearance may be rustic, facilities, amenities and services are 5-star. The professional villa manageress and her staff will take care of your every whim, and the in-house concierge service can arrange any excursion – should you manage to pull yourself away from the villa! A continental breakfast ‘with a twist’ is included in the rate as is a Chinese breakfast option and the services of the talented chef are included in the rate of the villa. The chef delights in using produce from his own herb and vegetable garden, and with so many different spots to enjoy a meal, whether indoors or alfresco, it’s a good idea to make full use of this service, be it a barbecue by the pool, or a formal indoor dinner for a special celebration. Whether it’s a family reunion, a wedding celebration, or just a much needed break.